The Dashboard page is the landing page when you log into the Cloudify Console. 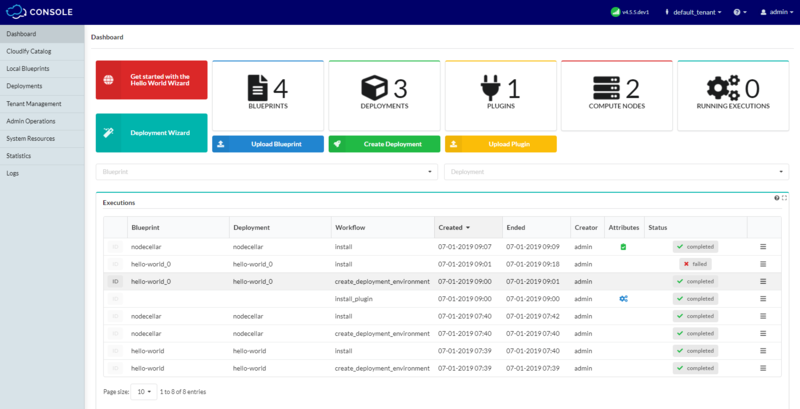 By default, the page displays the most commonly used widgets, including the number of blueprints, deployments, plugins, node instances and running executions on this Cloudify Manager. You can also start Deployment Wizard from this point by clicking on of the wizard buttons ( check this page for more details). An overview of the current and recent processes on the Cloudify Manager is provided by list of all the executions on the Cloudify manager. You can configure it to show executions for a specific blueprint or deployment. Admin users can customize this page and all pages, including which widgets are shown and their position on the page.